DES MOINES – U.S. Senator Barack Obama (D-IL) today announced that he has introduced an Iowa-specific campaign website to help Iowans stay informed and get involved in his campaign. Obama’s Iowa website can be viewed at www.barackobama.com/iowa and will include a calendar of events and activities, contact information for Obama’s 12 Iowa offices, a blog, videos and more. 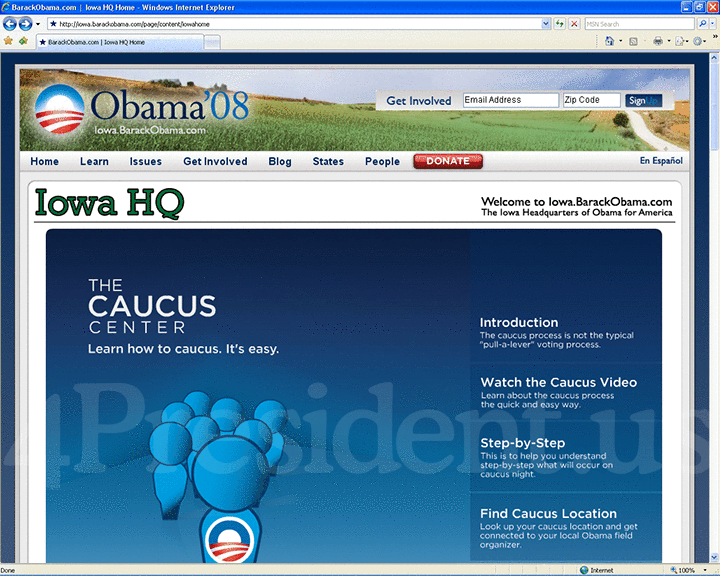 Obama’s Iowa website further demonstrates his commitment to competing in Iowa and adds to his already impressive efforts to help ordinary citizens organize online. Currently, Iowans and Obama supporters across the country are using my.barackobama.com to organize their friends and communities. This past weekend, Senator Obama made his 6th visit to Iowa since announcing his candidacy for President in early February.